Surfer with marginal lid laceration. An 18-year-old male was surfing a thruster shortboard in 5 foot waves. He fell on takeoff, was tumbled, and his board recoiled striking him in the right eye, causing a significant right upper eyelid laceration. He was transferred from a walk-in clinic to our tertiary-care trauma center for ophthalmology consultation. He states his vision seems normal but his eye feels irritated. He denies floater or flashes of light either eye. The patient denies loss of consciousness, head ache, neck pain, or other injuries. 1.5 cm right upper-lid marginal laceration at the iris margin. The laceration is through the entire upper lid, splitting the lid open. There is no canalicular involvement. 0.75 cm conjunctival laceration deep to the eyelid laceration, no underlying scleral laceration. Slit Lamp exam: The right cornea shows mild sparse superficial punctate keratopathy with fluorescein. Anterior chamber: Deep round and quiet. Iris: Round and reactive. Lens: Clear. Vitreous Humor: Normal. Surgical technique for marginal lid laceration repair. We present a case of a marginal lid laceration that fortunately cause no significant globe injury. Although eye injuries account for a small proportion of surfing injuries, they often cause significant morbidity. Pro surfer Derek Hynd, and wetsuit pioneer and legend Jack O’Neil are both testament to fact that you can lose an eye from surfing. Note however, that both of them continued to surf for decades after their injuries. Nathanson et al’s survey-based study of 1,237 surfing injuries found that 37% of all surfing injuries were to the head/neck region, and that nearly half of those were lacerations. Among those injuries were 15 eye injuries, 3 of which resulted in permanent loss of vision. All eye injuries were the result of trauma from a surfboard (11 own board 4 other board) with the nose, fin, and tail of the board being major culprits. Kim, et al reported a series of 11 severe eye ocular injuries, 5 of which resulted in globe ruptures and permanent monocular vision loss. Zoumalan described a series of 3 similar injuries. Recoil of the board on its leash causing the nose or fin of the board to strike the surfer’s eye was cited in both studies as a common mechanism of injury. 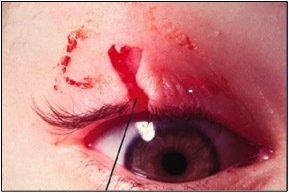 Orbital wall fractures and eyelid lacerations were also commonly reported. All but the most minor surfing-related eye injuries should be referred to an ophthalmologist. 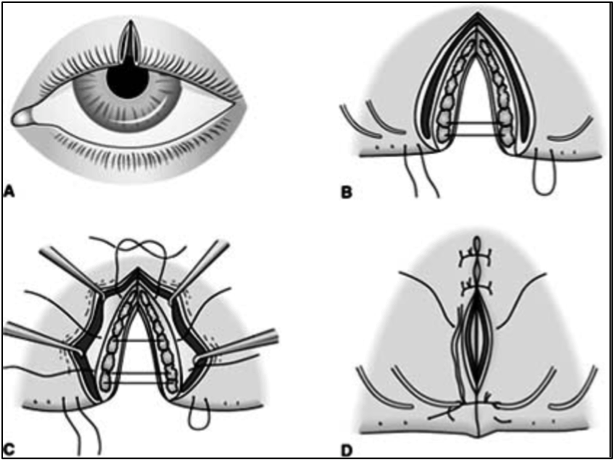 Certainly all eyelid injuries, lacerations involving the canalicular structures (near the medial canthus) and globe ruptures require emergent consultation. A ruptured globe should be suspected if: the pupil is not round (e.g. teardrop pupil); if there is blood in the anterior chamber (hyphema); or if streaming of vitreous humor is observed when fluorescein stain is applied under slit lamp microscopy (Seidel’s sign). If an operative procedure is required, the ophthalmologist should be alerted to the potential of a fiberglass foreign body from a surfboard shard. Eye injuries from surfing are largely preventable by making simple design modifications to surfboards which will not significantly alter performance. Purchase boards with a rounded “dolphin” nose. Surfboards with sharp, pointy noses are a recipe for disaster. Instead the tip of the board should be rounded to a radius no smaller than a tennis ball. The same principle applies to the tail(s) of the board. Dull the trailing edges of your fins with sandpaper, and avoid fins with pointy tips. Consider outfitting your board with break-away fins and flexible rubberized edges such as those made by SurfCo Hawaii. Leashes should be designed to minimize recoil. Surfers should take precautions to avoid being struck in the head or face with their boards after a wipeout. Offshore conditions are particularly hazardous because board have a tendency to get airborne. Keep arms crossed and overhead after falling until you surface and see that your board is not above you or recoiling on the leash towards you. Nathanson A, Haynes P, Galanis D. Surfing injuries. Am J Emerg Med. 2002;20:155–60. Zoumalan C, Blumenkranz M, McCulley T, Moshfeghi D. Severe surfing-related ocular injuries: the Stanford Northern Californian experience. Br J Sports Med. 2008;42:855–7.